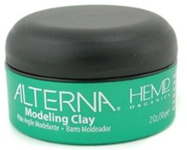 Alterna Hemp Organics Style Modeling Clay is a mud based molding clay that provides a long lasting, firm, and a touchable hold with a satin finish. It is great for creating dramatic styles. To Use: Rub a small amount onto fingertips, apply to dry hair for definition and control, and style as desired.